Car accidents are unfortunately common experiences that impact nearly everyone at some point. According to data compiled by the National Highway Traffic Safety Administration, there were more than 35,000 traffic fatalities and 2 million traffic injury victims in 2015 alone. These staggering numbers highlight the epidemic of automobile accidents on our nation’s roadways. Rear-end collisions are common occurrences, often leaving vehicle operators and passengers with extensive physical and psychological injuries. At the Larson Law Firm P.C., we’ve spent decades helping accident victims hold responsible parties accountable for their negligent and reckless actions. We understand the physical, emotional and financial difficulties that accompany a serious rear-end collision and work diligently to help you recover the restitution you deserve to restore your quality of life. Our dedicated North Dakota car accident attorneys aggressively fight for your rights after a rear-end collision. While neck and spinal cord injuries are the most common injuries stemming from rear-end collisions, many victims also suffer head injuries from hitting the steering column or dashboard. Lacerations are also possible if the impact is strong enough to send the victim into the windshield. Regardless of what type of injuries you have, you deserve an experienced legal advocate on your side to protect your best interests and seek the justice you deserve. After a car accident, victims often have many questions and no idea where to turn for help. Accident investigations require a high level of attention to detail and extensive evidence to be successful. Our legal team understands how overwhelming this situation can be for an injured victim. That is why our knowledgeable injury attorneys provide you with legal guidance you can trust. We work collaboratively with all parties involved, including the other drivers, insurance companies and potential witnesses to develop a solid legal strategy. With our full-service legal representation, you may be able to obtain compensation for lost present and future wages, medical bills, and pain and suffering. Rear-end collisions are serious accidents that often lead to long-term consequences. 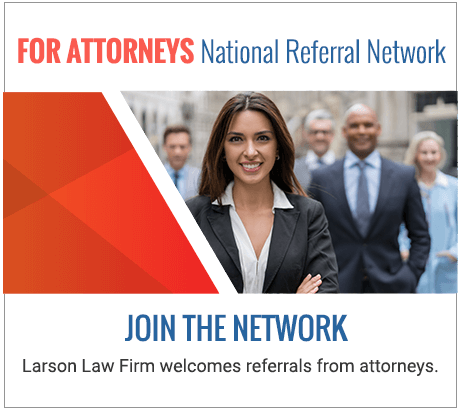 If you or a loved one has been injured in a vehicle accident, turn to the North Dakota rear-end collision attorneys at the Larson Law Firm P.C. for a free initial consultation and no-obligation case review. Call us at 701-484-HURT or complete our contact form today. We handle cases at our office location in Minot, where we also serve the residents of Ward, Williams, McKenzie, Pierce and Mountrail Counties.